J.P. Massie, born c1873, North Carolina. John W. Massie, born c1878, North Carolina. Massie, William, age 29, born in North Carolina; parents born in North Carolina; farmer. Massie, F.B., wife, age 25, born in North Carolina; parents born in North Carolina; keeping house. Massie, J.P., son, age 7, born in North Carolina; parents born in North Carolina. Massie, George, son, age 5, born in North Carolina; parents born in North Carolina. Massie, John W., son, age 2, born in North Carolina; parents born in North Carolina. Patterson, Minnie [unclear], servant, age 23, born in Virginia; parents born in North Carolina; single; house keeper. Vasser [unclear], W.H. [uncleear], servant, age 20, born in North Carolina; parents born in North Carolina; single; farm hand. Morgan, Joseph E., head-of-household, age 42, born July 1857 in North Carolina; parents born in North Carolina; married 2 years; occupation: farmer; owned farm (free). 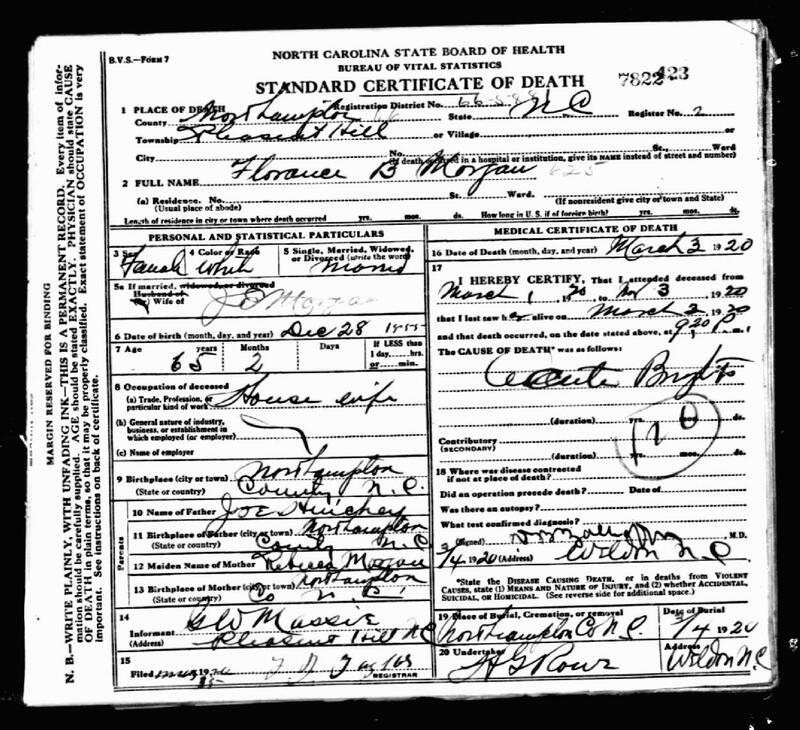 Morgan, Florence V., wife, age 45, born Dec 1854 in North Carolina; parents born in North Carolina; married 2 years; 7 children [unclear], 6 living. Morgan, Eula, daughter, age 14, born Mar 1886 in North Carolina; parents born in North Carolina; attended school 5 months. Morgan, Allie, daughter, age 11, born Jan 1888 in North Carolina; parents born in North Carolina; attended school 5 months. Morgan, Mary L., daughter, age 7, born Nov 1892 in North Carolina; parents born in North Carolina; attended school 5 months. Morgan, J E, head-of-household, age 51, born in North Carolina; parents born in North Carolina; second marriage, married 12 years; occupation: farmer, home; owned farm (mortgaged). Morgan, Florance B, wife, age 54, born in North Carolina; father born in Ireland; mother born in North Carolina; second marriage, married 12 years; 7 children, 6 living. Morgan, Mary L., daughter, age 17, born in North Carolina; parents born in North Carolina; attended school. Cox, Mrs. Bettie, cousin, age 65, born in North Carolina; parents born in North Carolina; widow. Morgan, Joe, head-of-household, age 61, born in North Carolina; parents born in North Carolina; owned home; occupation: farmer, farm. Morgan, Florence, wife, age 66, born in North Carolina; parents born in North Carolina. Hinchie, Mary, daughter ["adopted" written to the left], age 14, born in North Carolina; parents born in North Carolina; attended school. 1860 census, Gaston P.O., District 2, Northampton County, North Carolina; roll M653-908, page 25, line #8, dwelling #206, family #206. 1870 census, Gaston P.O., Gaston Township, Northampton County, North Carolina; roll M593-1152, page 521, line #13, dwelling #137, family #137. 1920 census, Pleasant Hill Township, Northampton County, North Carolina; roll T625-1313, ED 78, page 7A, line #10, dwelling #104, family #104. 1900 census, Gaston, Northampton County, North Carolina; roll T623-1209, ED 67, page 9A, line #6, dwelling #153, family #156. 1910 census, Pleasant Hill Township, Northampton County, North Carolina; roll T624-1125, ED 82, page 3A, line #8, dwelling #46, family #46. Ancestry Family Tree data "webster2FTW_2013-11-08" posted by "KWEBSTER". 1880 census, Gaston Township, Northampton County, North Carolina; roll T9-974, ED 181, page 224A, line #6, dwelling #34, family #34. Ancestry Family Tree data "Miller Family Tree" posted by "ancientfriend". Ancestry Family Tree data "Thomas Kea" posted by "cindikea1960". Contribution from William Hancock (). Ancestry Family Tree data "Crew Family Tree" posted by "RobinCrew65".